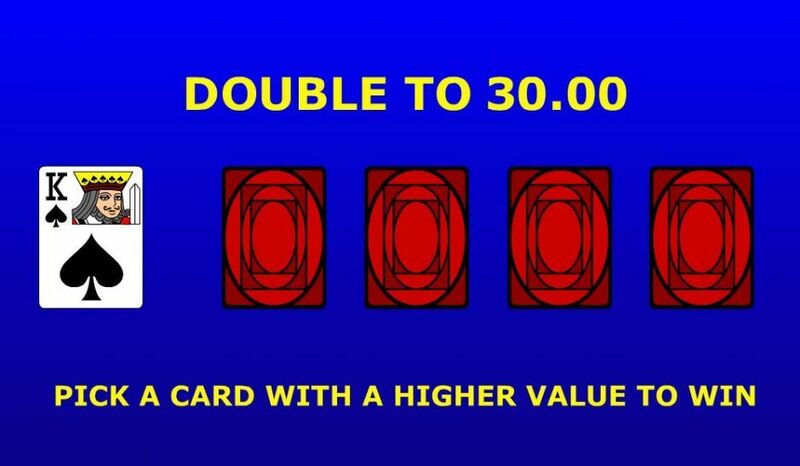 Here's a whole new Video Poker variation for you - enjoy! 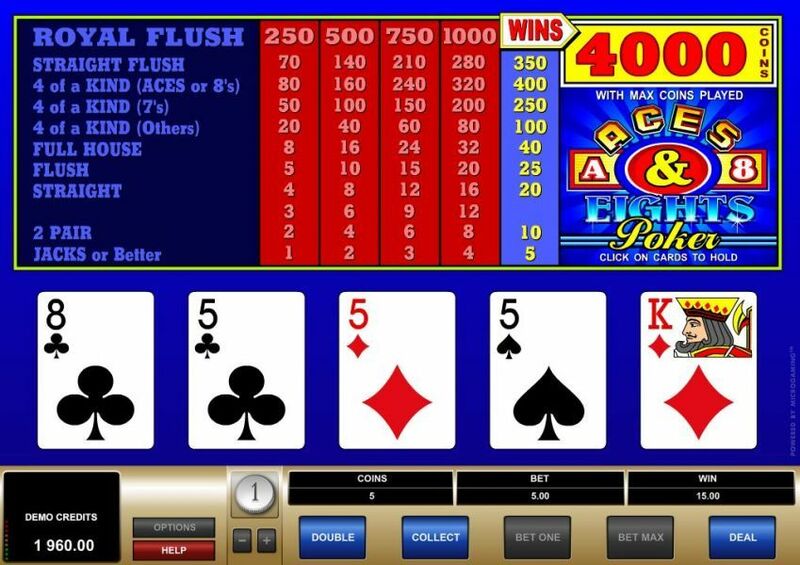 Aces and Eights Video Poker is a rare find at land-based Casinos - you can play it online on this page. If you know a thing or two about real money Casino games, you know that playing Video Poker is one of the best choices you can make based on the house edge of most Video Poker variants. Whether you decide to pick Jacks or Better, Joker Poker, or Deuces Wild, you know that you are in for (potentially) a better return as the house edge in Video Poker is better than in most gambling games. Play the right Video Poker variants with a truly optimized strategy, and you could bring the game's RTP up to 99 percent and play with just a 1 percent house edge. With online Slots coming with an RTP that rarely goes north of 96 percent, this house edge is what makes Video Poker games like Double Double Jackpot, Double Joker, and Aces and Eights - to name a few - particularly lucrative. 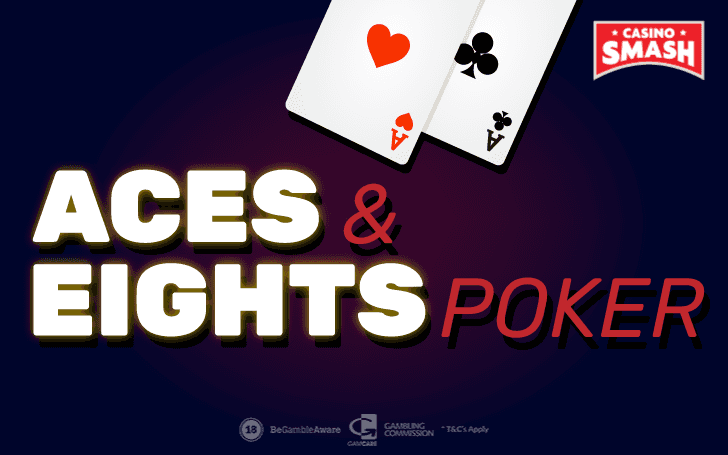 Today, we are going to focus on the Aces and Eights Video Poker variant to see how you can use this particular online Casino game to have fun and, if you are lucky, win some money too. The origin of Aces and Eights Video Poker is one of the most exciting ones I’ve heard in gambling. Legend has it that when an American folk hero Wild Bill Hickok died playing Poker, he was holding a particular card combination. Activate the Bonus and Play! 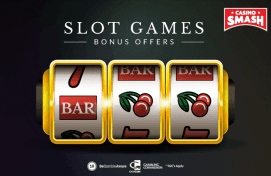 Play all the best games of Aces and Eights Video Poker online (and more) with a superb bonus offer! Activate the promotion, open the game, and good luck! This was a hand of two pairs of Aces and Eights, which is also called the "Dead Man’s Hand." 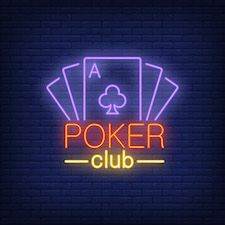 The rules of Aces and Aces Video Poker do not differ that much from those of other popular Video Poker types like Jacks or Better. You play it with a standard deck of 52 cards. The machine gives you five cards, you choose which ones to hold, and get another set of cards. Easy. The main difference doesn’t come from the gameplay - it comes from the payout table. Aces and Eights Poker pays some hands more than other Video Poker machines do. That's why you want to make sure you are lucky enough to get these ones when you fire up a game of Aces and Eights online. Here's a table that sho you the complete payout structure of a game of Aces and Eights online. In most Video Poker variants, a four-of-a-kind results in a 125-coin win. 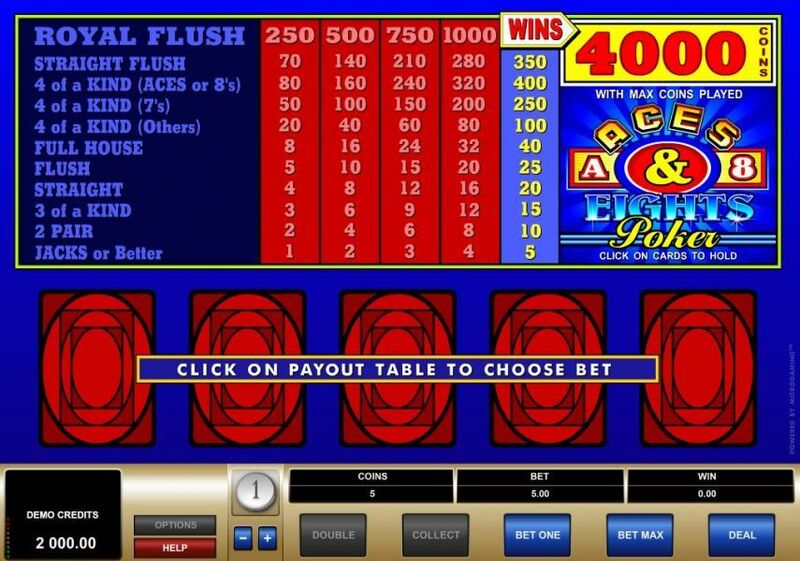 But since Aces and Eights is not like most variants, here the prize grows to a staggering total of 400 coins - making one of the best Video Poker games you can play online and, if you ask my opinion, a lot better than a lot of table games too. You find there an overview the most important aspects of Video Poker strategy (which can also be applied as Aces and Eights strategy). For those who haven’t played their fair share of Video Poker, understand what-hand-is-what can be daunting. That's why I compiled a quick list that explains the all the winning hands in Aces and Eights. Read it, save it, and make sure you uset it the next time you play Aces and Eights Poker online. Royal Flush. This is the best Video Poker hand you can ever get. These are five of the highest cards of the same suit. Straight Flush. These five cards have to be from the same suit and (usually) have a consecutive order. Four of a Kind (Aces or Eights). To get paid for this hand, you have to collect four aces or eights. Quite self-explanatory. Four-of-aKind (Sevens). Four cards with the value of seven. Four-of-a-Kind (Others). Any four cards of the same value. Full House. Three of a kind + one pair. Flush. These are five cards of any value - but of the same suit. Straight. These five cards have to go in a consecutive sequence. However, their suits don’t matter. Three-of-a-Kind. Three cards of identical value. Two Pair. Two pairs of two cards of identical value. The suits don’t matter here. Jacks or Better. You might get this one quite often. The hand is comprised of a pair or Jacks, Queens, Kings, or Aces - a.k.a. high cards. The easy gameplay is one of the reason I love Video Poker so much. However, it might still be a bit confusing for a first-timer, so I’ll explain how to bet on Aces and Eights - one click after the other. Now, the game will give you the first hand of five cards. Click the ones you want to keep for the next round - and press the Draw button. And finally, you can see your final hand. Did you win? If you did, the game will offer you the chance to double your win. All you need to do is click the button that says Double - and a new window will open. Here, you will have to choose a card. If your card is higher than the dealer’s - you get double the cash. If not, you lose all your winnings. In other words, use this feature only on your lucky days - or ignore it altogether. So, to sum up, is Aces and Eights better than the other variations of Video Poker? Well, the answer to this question is both yes and no. It pays you much more for all the hands that include Four-of-a-Kind, so that’s a huge plus. However, each Poker variation has something cool to offer and is equally fun. So, the most sensible thing to do when you visit an online Casino is to play them all. Bonus info: terms and conditions apply to the offer. If something isn't clear, have a look at our review of Hello Casino for the T&Cs in full. The offer on this article might have expired by the time you read it. Please refer to the review pages for the latest bonuses and promotions available.